Yay cooldowns!! okay i’m really not that excited to talk about this stuff. I am pretty excited for Part 3 of the guide, but I would be remiss if I didn’t go over our cooldowns. It always makes me sad when i’m in a dungeon or raid and the tank has no idea how, or desire to use cooldowns. Especially if i’m healing the fellow. So lets start with our damage mitigating/healer’s mana saving buttons. FORTIFYING BREW: This tool tip isn’t accurate but it is pretty close. This is our big one. It gives 20% more health, Damage reduction, and amount of damage staggered. It will save your bacon every 3 minutes. You get it early in your leveling, so by level 90 we should have become comfortable with using it. At level 75 we have a tier of talent choices with save your but cooldowns. This tier is a great example of Blizzards attempt to give us compelling talent choices. Avert Harm and Diffuse Magic. They both are short cooldowns at a minute and a half each and both provide very different effects. If you are about to go into a boss encounter like Warmaster B. where there is an armor reduction mechanic Dampen Harm will be pretty strong. but on a fight like Yorsaj where the tank can take a lot of magic damage very quickly Diffuse Magic will be a better choice. I think most of the time Dampen Harm will be the choice, but the option of Diffuse Magic is excellent. There is one more Cooldown that will be Iconic for brewmasters. Guard. I have always liked absorb effects, and to get one that I can put up when I know I am about to do something stupid is great. I often do stupid things. 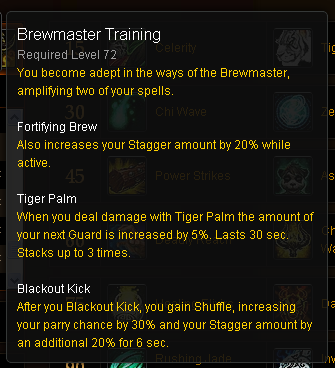 With Brewmaster Training three Tiger palms will buff our guard by 15 percent. 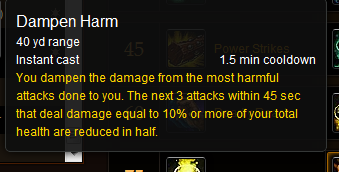 that is a healthy amount of damage mitigated by 100 percent every 30 seconds. We learn this at a really young age just like fortifying brew. Elusive Brew: for which I have no screen shot is really an interesting mechanic that was recently changed from a 45 second cool down that gave a flat 10% increase to dodge to something so much more fun. When your auto attacks crit you get 2 charges of elusive brew (depending on weapon speed. blah blah blah mathy stuff) . When you consume these charges you get 30% dodge for 1 second per charge. So ten charges gives you 10 seconds with a bunch of dodge. This is a cool button. With this, shuffle and Guard we have three ways of mitigating damage that are all very different and very effective. We need to talk about one last cooldown before we move to other fun buttons to push. 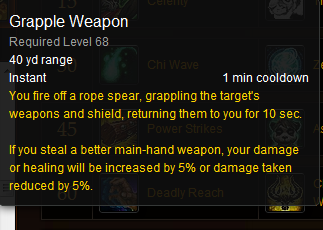 It isn’t a tank cooldown because it breaks on a melee swing. This is an off tank cooldown. I love me some off tanking. When in a raid, and the dude with the shield/fury hindquarters/glowing blue eyes, has the threat to all life on Azeroth’s attention this will relieve some preassure on your healers. 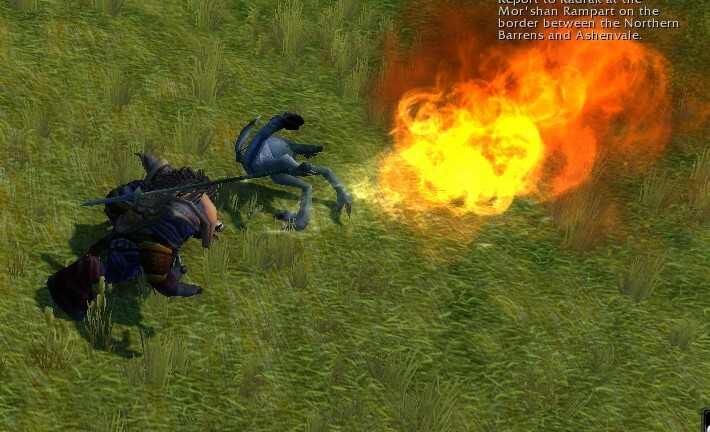 This would have trivialized Elementium bolt, or a stray fire elemental making a bee line for Sulfuras 2.0. It wont work in 5 mans but jee whiz will it come in handy in raids. This tool tip needs no explanation. it is almost as cool as roll. Every boss fight guys. Guard is cool share it with your friends. This makes me giddy as a school girl whose best friend’s sheep just followed her to school. We get a toy no other tanks get. (upon further review paladins can talent into repentance.) no more waiting to see if the hunter will freeze a mob in place, or if the mage in the group has poly-morph on its action bars. If you don’t want that mob to hit you in the face, or for it to heal it’s friends give it the old “vulcan neck pinch” , and proceed with pulling it’s friends around by the nose. For the next installment we will talk about putting it all together. I don’t really do how it should be done posts, but how I do it posts. So that is what your in for. Roll on little dogies. Roll on. My monk reached max level on the beta last night while questing in the dread wastes. I also finally got a chance to run through all of the 5 man dungeons. So there should be some brief 5 man walkthroughs coming up. Part 2 of the brew master guide will be up tomorrow, and part three later this week. It has been slow in coming because I have been queing as tank and heals, and I have been pulled in as heals consistently. So my mistweaver guide should be along shortly as well. 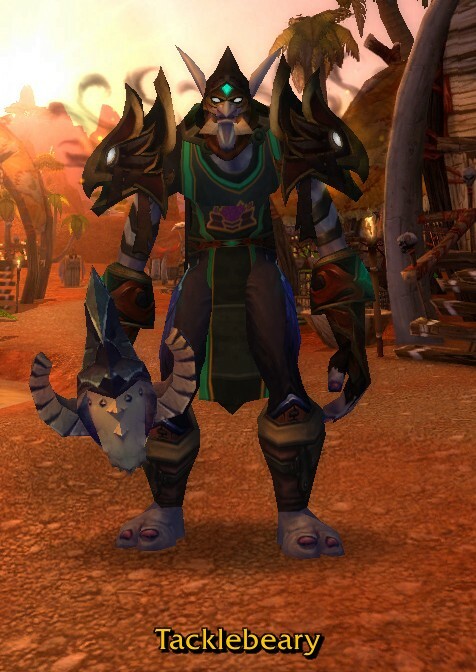 After hitting 90 I did three things, buy the PVP gear from the vendors (which just feels a bit dirty for a PVE guy). It gave me about 3000 more agility/intellect than my leveling gear. Which is a lot. Opened up the veil of eternal awesomeness, er blossoms. And ran a scenario. The scenario was fun, but I got stuck with 2 hunters. Hunters are fine. It’s their growling pets that drive me crazy while in a tank spec. The beer was successfully delivered so it wasn’t a total loss. I am apprehensive about jumping into heroics, because the increase in difficulty in cata was so severe. I know the design intent is different this time around. So I’m ready logically, but maybe not emotionally. If that makes sense. So the game has opened up to me at level 90. It was a very smooth ride leveling. The content was fun, not grindy, and doable even with the bloated population on the beta servers. Remember. Corpse circles are cool, but a trail of corpses across a zone is more impressive. Before I get started I want to point everyone to http://sunniersartofwar.com/. I know its weird to send readers off to another blog, but Sunnier is an excellent blogger. (and a seasoned tank. Like heroic madness seasoned) So go check the blog out. I don’t they are coming back. I promised coherent thoughts right? Well lets start then. 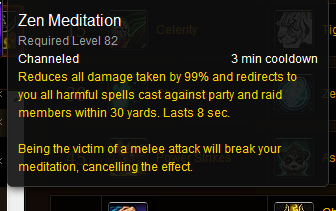 The aspect of Brewmasters that first caught my fancy was there damage mitigation so lets start there. Paladins have block and there mastery affects how much they block for, or how often they block. ( I think). Bears have savage defense which is a shield that is proced off of crits, and Death knights have there blood shields provided by there death strikes. A monk does it differently we Stagger. A boss hits you, 70% of the damage is immediately done to the monk. The other 30% turns into a dot that ticks away over 10 seconds. The dot gets bigger and bigger every time you get hit. A death knight tank’s blood shield absorbs melee damage. Brewmasters just move it around. Not really fair right. Well blizzard isn’t fair. Just sit with a paladin or mage for 5 minutes blizzards fairness will inevitably come up. So for the other tanking classes there block, Savage Defense, and Blood Shield make it so the damage doesn’t happen. ( I am oversimplifying all these mechanics bear with me.) Stagger intrigues me because we can modify it, by increasing how much we stagger or just make it go away. So how do we do that? We shuffle. At level 72 we gain a passive called brewmaster training. 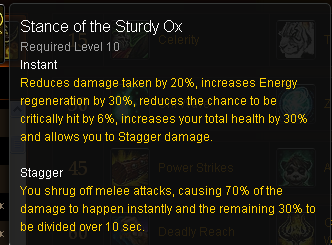 This passive affects stagger in 2 ways. First it gives us access to Shuffle. When you Blackout Kick you gain a buff called shuffle. Shuffle increases the amount you stagger by 20 % for 6 seconds , and increases your parry. So for those 6 seconds half of the melee damage you take turns into staggered damage. The other way brewmaster training affects stagger is it turns fortifying brew from an OK cool-down to a better than okay cool-down by making it increase the amount staggered by 20% also. 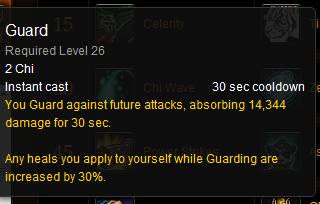 Our mastery also increases the amount staggered, and blizzard just fiddled with this in the last beta patch. So shuffle is a proc from Blackout kick that if we can have up 100% of the time. And fortifying brew is a 3 minute cool-down that adds another 20% to the amount staggered. Got that? So regardless of what percentage of our incoming physical damage is being staggered it is still damaging us. On my most recent run through Mogushan palace. (I’m in there so much lately I need to take some screen shots and put together a post.) I was mist weaving and after the second boss died I took a deep breath looked around the room and assessed the damage. We were all still standing so I turned around and started to roll towards the elevator. All of a sudden I had a dead tank. Poor guy let his stagger kill him. Don’t let your stagger kill you. Use purifying brew. Using purifying brew clears your stagger. It is cheap at a cost of 1 chi and will help avoid myocardial infractions for your healers. It has no cool-down costs 1 chi and can make a lot of pain go away. So that is part 1 of my brewmaster overview. The next installment will be part 2. we will talk about our cool-downs, Part 3 will be about threat and how I try to make this all work together in making piles of corpses for easy looting. The Case For The Monk. I am going to have a main for Mists, come hell or high water. I have never had one before, and because of life and schedule changes I really only have time for one. Tank, DPS, and Healing. I really like doing all three, and if I m only going to have one character raiding (I raided on 7 different classes in Cataclysm) it needs to be flexible. The good thing is there are three classes that make this possible. Paladins, Druids, and Monks. None of this info is new. (If you want new info you probably wont find a lot of it here.) 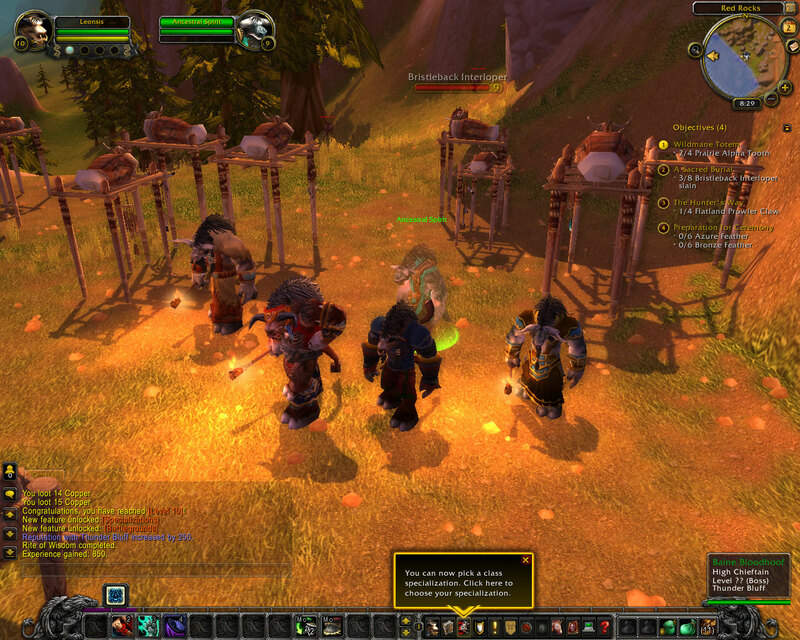 I have healed raids, and DPS’d with both the druid and paladin, and ran 5-mans in all with them as all three roles. I have a pretty good grasp of both classes. I have a little table in my notebook and have no idea how to make one here so i’m going to wing it. Please bear with me. As you can see in my own personal conceit i consider my self an above average tank and healer, and average DPS’er. Of the six specs with both scores I like paladin healing best, and ret the least. The monk numbers are even more subjective than those for the other classes. I have an 88 monk on the beta that I have been really enjoying hence the two 8s. The question marks are there because of a lack of data. Sstuff has routinely died in the 5-mans I have tanked and DPS’d but it is to soon to tell if i am any good at it. Here is the part where I ramble about my opinion on each class and there pro’s and con’s. There she is Berdran a beacon of light and hope to all who charge into the heated fray off battle. Retribution: I have never really been a big fan of how retribution played. It has never been terribly enjoyable for me. So i never got very good at it. Protection: I generally have fun tanking. When i do it the other guy usually dies. I wish that they could have found a better way to utilize holy power for protection paladins. Holy: They really got Holy right in cataclysm. The Holy Radiance change in 4.3 was brilliant. I love love love this spec. Holy Power seemed to work best for healing. Feral Bear (guardian now i guess): It is a fun spec, and I have had success in 5-mans as a bear. Restoration: Restoration is a really good way to keep your friends, or allies alive. 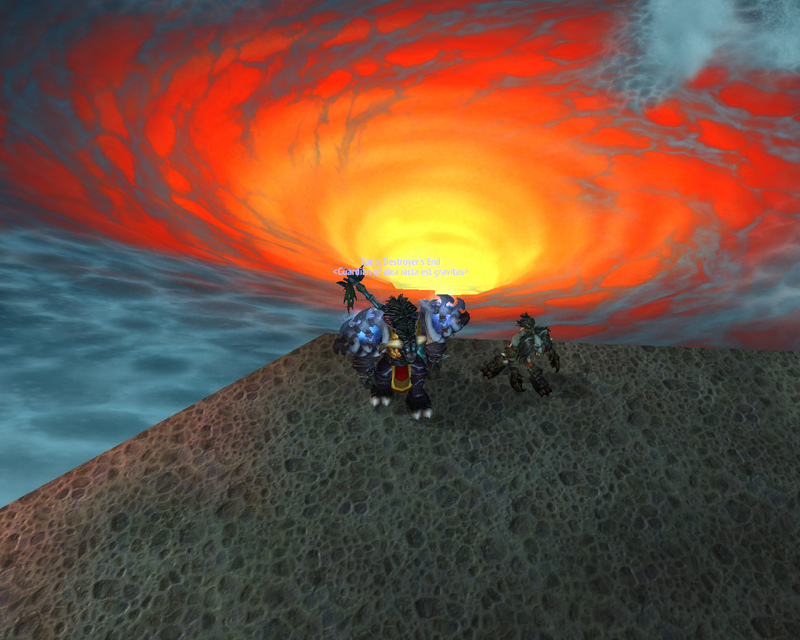 i went through all of Firelands as a resto druid and really enjoyed myself. This is a Tauren Monk. 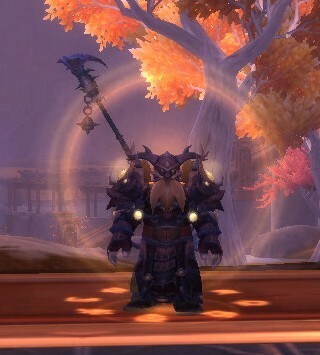 The monk I am actually pushing to 90 is a Dwarf but my monk on live will be a tauren. Or I would have to change the blogs name. 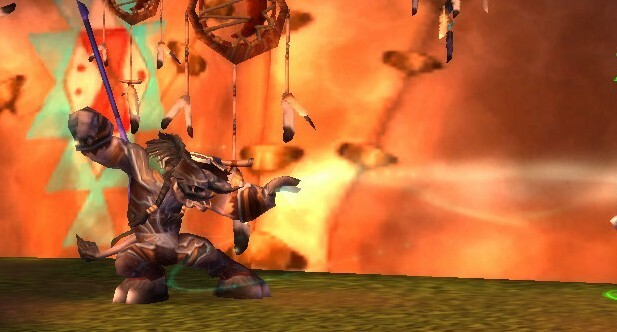 I really like my blog name so the monk shall be tauren. WindWalker: It’s fun, fast paced, and Chi is exactly what Holy Power could have been for ret palis. The lack of measurement tools on the Beta means i have no idea if i’m any good at it. Brewmaster: I have finally come to grips with the specs name. Brewmaster was kind of a let down. I really like the set up though. I’m already in love with Stagger as a mitigation mechanic. Coming from a DK tanking perspective i foresee no problems getting into what blizzard is trying to do with tanks in Mists. Mist Weaver: I think that’s what there healing tree is called. It is the only thing I haven’t tried on the beta, but i am building a set and will try it very soon. my only input here is when I briefly speced heals and cast them on random folks wandering around Orgrimmar I had very substantial giddy feeling. Which is very promising. I could play any of the three classes and have fun. Druids are solid across the board. Paladins only draw back is retribution for me. ( and I am hearing good things about it from other beta testers.) Monks have a lot of potential and it is the way i am going to go. Leveling on the beta has been a lot of fun (from 1-40, and 85 – 89 so far) I had been reluctant to put any serious time into a premade 85 because i wanted that ” Wide eyed holy bleeping crap!” moment when I first got the expansion. If i’m starting a class from 1 most of that will be spoiled by simply being in G- chat well before I get to 85 . so to avoid faction specific stuff I made a dwarf pre-made to hopefully keep some of that fresh. So look forward to Monk info becoming the focus of this here blog. we will start with how I brew master later this week. I am avoiding a Cataclysm is over post for now, even though it is over. I am ready to provide some thoughts though. • Uldum was ok. Twighlight Highlands was better. Never spent any time with Harrison Jones, or finished Twi High. Always started gearing the second I hit 85. • LFR worked: I went from an ilvl 342 on my DK in mid February to tanking DS in early march. It made the transition so much easier going into the real thing. • LFR. Worked: we could bring in a random sub on raid night and say “this fight is the same, but has one more mechanic you need to watch for. •Inscription and alchemy are cheaper to level than other professions. • Tauren are cooler than blood elves. • Having a full tier set for the first time I understand why people get so worked up about there looks. • I get to beat Cataclysm every week. • The molten front was a cool idea, but way to much of a grind for more than one toon. •. Titles are fun. I don’t have very many. • I have run out of bullet points. OK so I have been lost in D3 for a couple weeks. I wanted to keep this a straight wow blog and pretty much anything I had to say about Diablo 3 is out there already. So I avoided typing about it until now. So why start now? I had a wow moment in my D3 last night that’s why. My raid teams main tank and I ( I off-tank for our team) both started out as barbarians. Last night we were talking D3 shop. Our builds mostly. I usually run frenzy/whirlwind. He likes cleave/I dont remember. I hopped in his game for a minute so he could give me some hand me downs. (He is an act ahead of me in NM) He was using a 1 hander and a shield, and I was standing there with the narliest two handed weapon I could find. I laughed out loud. There we stood the paladin and death knight playing barbarians with the exact same preferences and play styles we use in wow. He wanted the survivability of a shield. I wanted a big 2 handed weapon and as much self healing as I could get. So have you guys found your wow preferences bleeding over into D3 or other games? I got Gurthalak, Voice of the Deeps out of LFR last night, and though it was exciting for me, I don’t expect my readers to care. (but it is awesome you guys go me.) (and i really like perenthesis youll see that over time.) The reason this post is coming out is because what happened when i won it. So after making enough strange noises to get a “look” from the Red Head (wife) i decided that for the blog I would wait around and see if I get any response from my victims. A pali immediately whispered and politely asked if i would be willing to trade it for the shoulders he had just got from spine. “nope” was the response and he LOL’ed back. I then got a tell from another DK who asked and he got the same response. however there was no LOLing from this fellow. He wasn’t rude, his response was “but your frost”. I was at the time, but I’m not anymore. A hard and fast hitting spec that relies heavily on two procs, killing machine, and rime to put out solid damage. It has an awesome 1 minute cooldown in pillar of frost that gives you a metric ton of strength for several seconds. Currently performs best with 2 one handers in PVE and a big 2 handed weapon in PVP. It is chaotic and fast with strong burst AOE. Unholy death knights have strong pets at their disposal. Our ghoul is iconic and when under the effects of Dark Transformation hits really really hard. The Gargoyle is on a 3 minute CD and is our other pet. The rotation is smooth and flows well. And Unholy Frenzy is just plain fun. It’s usually more DPS to give it to someone else, but it’s ok to be selfish sometimes. Ah the tank spec. I love it unlike warriors and paladins who only get one shield we get 2. Bone Shield and Blood Shield. The rattle from putting up bone shield pre pull just gets my mind right for the upcoming boss, and 20% damage reduction doesn’t hurt either. I mentioned in my last post my favorite thing about blood tanking. Having a Blood Shield as big as your health pool right before a tank swap is amazing. Death Strike as often as you can, and use your cooldowns. Please use them we have lots and there all strong. Get in the habit of blood tapping. You won’t miss the threat from one heart strike. All three DK specs are fun they are all different, and they are all viable. Go out in Azeroth and be a DK. Leave a trail of corpses in your wake. After all that’s why Arthas made us. Have you ever been kicked by a cow? No? Me either, good thing to, I know a guy who has. He didn’t like it. I have also become acquainted wit a tribe of quillboar who were savaged be a by a kicking cow. They also didn’t seem fond of the experience. The cow on the other hand enjoyed the experience immensely. 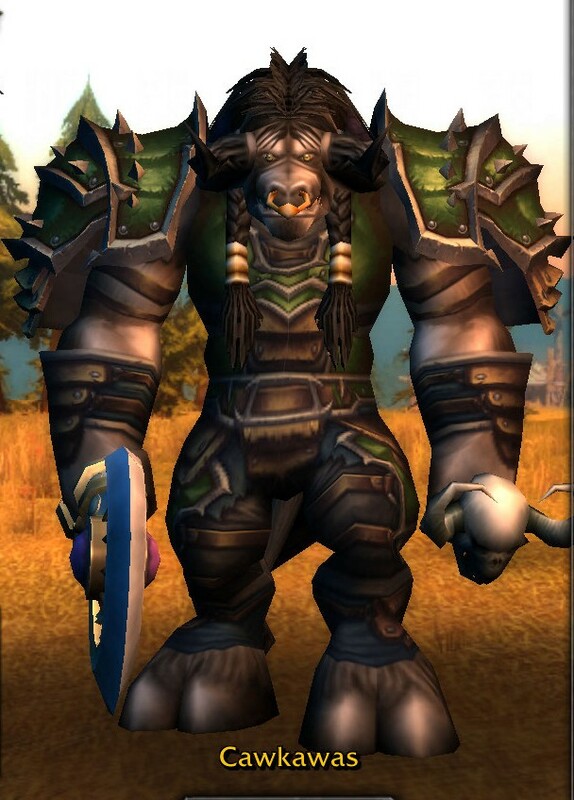 My first impression of the tauren monk was and is that they have surprisingly short legs. Strange right? On the way to level 10 the monk gets 4 abilities Jab, Tiger Palm, Roll, and Blackout Kick in that order. At this point the coolness of these abilities go in this order 1) Roll 2) roll 3)roll then the other 3. A tauren rolling around Mulgore is a sight to behold. The head first dive into a tuck and roll, then the sway into into a combat stance. I was hooked. 2 levels later i got Blackout kick, found a hapless Quillboar wound up a Blackout Kick and said “What, that was it?” After a few more Quilboar had Hoof marks on there ugly little foreheads i was underwhelmed. I proceeded to roll of in the direction of some malingering Grimtotem’s , and all my worries blew away on a soft Mulgore breeze. Fittingly I hit level 10 in the midst of quillboar. A few feet away stood Baine and Hammul with torches ablaze at the foot of Cairne’s bier, and it just felt right. 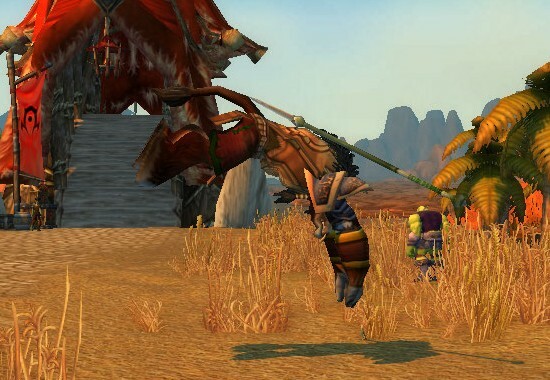 I pointed myself in the direction of the Barrens, and set of to do what young taurens do best. Collect the heads of centaur chieftans. A Few More Notes On Monks. Brew Master- Woah Brew Master. I immediatly started having more fun when i went tank spec. you get a cleave right away in Keg Smash. and Dizzying Haze gives you a targeting reticule like the rogue ability blind. it slows your oponnent , and gives them a chance to hit themselves instead of you. And the damage still seemed pretty strong. I mean stuff still seemed to die at an acceptable rate. Stagger- It is an intriguing mechanic. My monk will be tanking Ragefire Chasm soon. ( he is only lvl 13, DCing every 4th time i looted a mob convinced me it was bedtime.) Turning 30 % of damage taken into a DOT is a cool mitigation tool. I’m not sure if it will as fun as taunting a raid boss with a blood shield the size of your health pool saying “Go for it Warmaster. Try me on for size.” but it has potential. Clash- Quote “you and your target charge each other, meeting in the middle and stunning all targets within 6 yards. 35sec cooldown, 40yard range. I can’t wait to see this in action. if this works on casters ill be ecstatic. You don’t want to know what ill be if it works in PVP. Mistweaver- I’ll probably leave this till MOP goes live. I love healing. i really enjoy it, But without VuDuh . Aw dang now im going have to give it a shot. Grumble, Grumble, Grumble. Oh Hey did I mention ROLL!!!!! 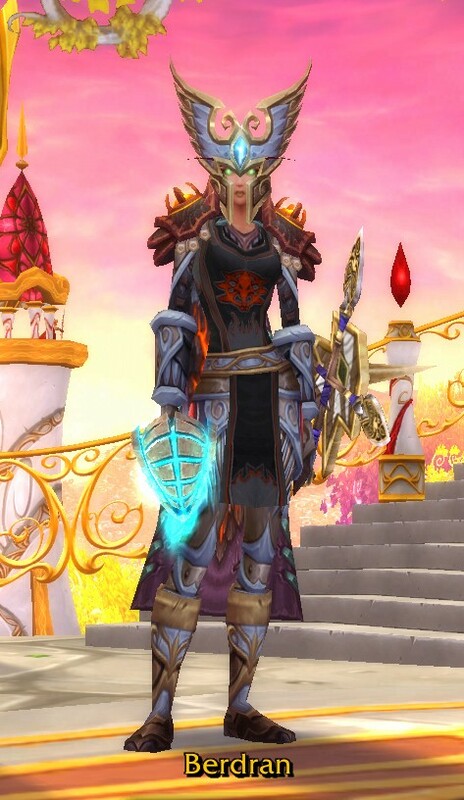 My first toon was a night elf hunter. Yeah this blog was started by that guy. After being abandoned by first a spider (who I had tried to abandon first, but failed.) and then an owl. I turned to the interwebs for answers. I found them in the form of blogs. BRK saved my baby hunter. Ratshag made me laugh, hard. The goof ball at paladinschmalidin taught me not to be scared of filling health bars. And dozens of other blogs entertained me. Filling my google reader for long days at work. And providing answers to every question I had. I saw a unique gaming community and felt I was in a small way a part of it. I now am done being in the audience, and after years of playing and reading about Azeroth I think I’m going to write about it to. My name is BadT I am currently playing a DK for my raid team. Horseshoes and Hand Grenades. A subsidiary of the amazing Alea Iacta Est guild on Earthen Ring. I should put the mission statement here, but I don’t have one yet. So for now I’m a WoW blog. Tune in soon and we will see where it goes. I was working my way through my google reader after getting to work yesterday and found something intriguing.